Boston became the golden child of the United States Olympic Committee on Jan. 15 when it was named the bid city for the 2024 Olympics. Three days later, Deflategate was born after the Patriots’ victory over the Colts in the AFC Championship game. One died on Monday. The other is still kicking. 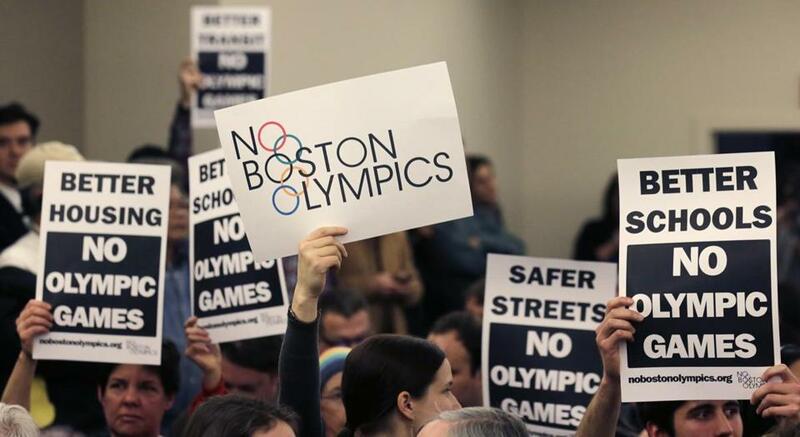 Boston 2024 organizers and the USOC threw in the towel on the city’s bid for the Olympics on Monday. Meanwwhile, those at 345 Park Avenue in New York — NFL headquarters — continued to breathe life into Deflategate, while fans and media await commissioner Roger Goodell’s ruling on quarterback Tom Brady’s appeal. The stories have cohabitated in Boston’s sports scene since January. Could they get buried around the same time? Many have speculated that since the Patriots open training camp Thursday, Deflategate’s lifespan might be nearing its end. Of course, if the NFL was looking for a prime spot to drop the news under the radar, it missed a golden opportunity Monday when media began planning Olympics postmortems. Follow Matt Pepin on Twitter at @mattpep15. Follow Rachel G. Bowers on Twitter at @rachelgbowers.